My mother wrote the obituary that appeared in Monday's Norwich Bulletin. Exhibit A in how I inherited my penchant for writing at length rather than editing for conciseness. BROOKLYN - Pasquale (Pat, P. Joseph) Galante, 86, long time resident of Waterbury, died July 11, 2008 in Brooklyn, Connecticut after a long illness. He was the husband of Dorothy H. (Champagne) Galante. 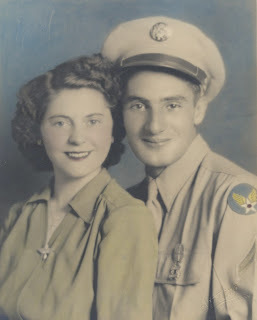 Pat and Dot celebrated their 63rd wedding anniversary on May 5th, 2008. Pat was born on March 19th, 1922 in Brooklyn, New York, one of five children of the late Luigi and Mary (DiPaolo) Galante. His family moved to Waterbury when he was a young child and he lived there until May 2007, when he and Dot moved to Brooklyn Connecticut to be close to their children and grandchildren. Pat worked at Chase Brass and Copper Company before serving as a Radio Operator in World War II. Chosen for specialized training, Pat served with the 27th Troop Carrier Squadron. As a Staff Sergeant crewing C-47's in the China-Burma-India Triangle, Pat flew over 600 hours in hundreds of missions over some of the roughest terrain in the world. Serving with distinction, he was the awarded the two highest combat air medals, the Distinguished Flying Cross with Oak Leaf Cluster and the Air Medal with Oak Leaf Cluster (Oak Leaf Clusters are the designation of receiving each medal more than once), the Asiatic Pacific Theater medal with three Bronze Stars and several other medals, including one from the Chinese Air Force for outstanding humanitarian service. Pat received the Purple Heart for wounds sustained when he was shot down over the CBI. The men with whom he served became his lifelong friends and he attended reunions of the 27th all over the country. After his return, Pat served in the Air Force Reserves and worked for the State of Connecticut as Chief Purchasing Agent, retiring in 1985. Besides his wife Dot, Pat leaves his son and daughter-in-law, Richard and Janet Galante of Pomfret, CT. and his two daughters and sons-in-law, Meg Galante-DeAngelis and Mark DeAngelis of Willimantic, CT. and Michelle Galante-Plucenik and Rob Plucenik, of Brooklyn, CT. But his proudest legacy is in his grandchildren, Seth, Carlo and Emily Galante; Benjamin, Graham, Wheeler and Brighid DeAngelis; Alex and Andrea Plucenik; and Caitlin DeAngelis Hopkins and her husband, Peter, who Pat welcomed into the family with open arms last July. Pat also leaves his sisters, Dolores Ostroski and Gloria Iavasile, his brother and sister-in-law, Michael and Kathryn Galante, his sister-in-law, Lucy Galante, his best friend of 81 years, Jerome Arcaro and many nieces and nephews, great nieces and nephews , great - great nieces and nephews and friends. He was predeceased by his brother, Philip Galante.